I'm in the midst of a complete apartment re-haul and loving it. 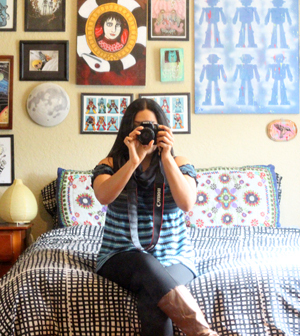 While on a yard sale binge last weekend (got lots of cool vintage goods to show off soon!) I recalled why I used to go to yard sales so often before I was a reseller: it's a great way to get practical housewares for pocket change. I paid fifty cents each on two scores that saved me some valuable shelf space. Then there was this sleek plastic file organizer I could hang on the wall for more nifty record organization. I liked how it was clear, allowing the record art to show through. This is the record pile before, at the bottom of a bookshelf, taking up valuable book shelf space. You can't access them easily like this, either. And my new "library corner" has some bright beautiful record art on display. I see this method working well to organize art supplies (scrapbooking papers, etc.) and favorite books or magazines. 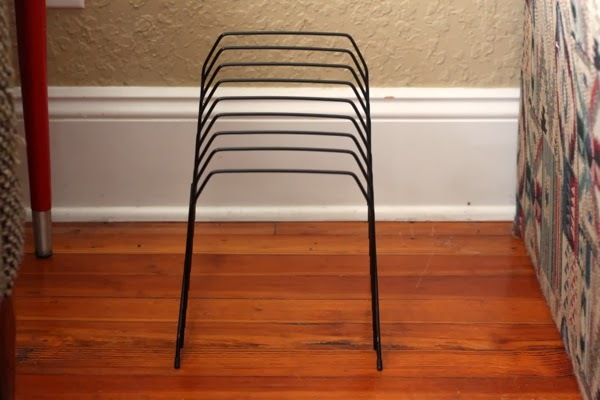 Keep an eye out at the yard sales and thrift stores, I often see file organizers and I'm sure their numbers are increasing as file storage moves into the digital era. Got any nifty thrift storage techniques to tell? Do share in the comments. What records do you collect? My Stevie Wonder, Jackson 5, Michael Jackson, and Prince record collection is sizeable. I also love disco, funk, and soul. Get rid of everything in your house and you find that garage sales are like Candyland! You get excited over measuring spoons! The clear one's are a good idea, they don't look so officey like the black one's do. Even though you could paint them, hmmmmm. My poor office right now. I look like a damn hoarder. I need spacesavingitemsbookshelvesomghelpme. I did consider painting, I do have some bright orange spray paint tha'd make them spiffy as hell. :D I deep-purged and sold off a lot so I'm at that Candyland stage again, just a tad. I made a little corner with free-found bookshelves in the corner of my office/dining room/living room combo area and it's making me happy. Now I need more to organize my packaging hoard! Hello! Thank you for your lovely comment, how splendid to meet you! I don;t collect records anymore, but do still have all my old vinyl, mostly from when I was a Goth in the 80's! I still have my 45's and some 12' s too! what a great idea! I found vintage vinyl holder the other day but my brother shot gunned it for christmas haha. So I think I might give this a try! It looks really good! Thanks! Good luck hunting them down. I used to see them often when I thrifted and hit yard sales a lot. Great job "repurposing." Yard sales can be a great source for unique items if you have a good eye. You sure do! I'm going to do a series on repurposing found items. Thinking of calling it "MODify" ;) Won't be all mod items but will still be fun. I'm cringing looking at the records without sleeves! As a diehard record guy I understand the need for space saving record ideas. I have 3,000. I'm still looking for space! Your cringe, Eric. I'm horrible! Horrible, I say. They have since been placed into protective sleeves. 3,000 is an epic collection! Thanks :) Hope they help. I LOVE the clear organizer.........showcasing the art on the albums! BRILLIANT!!!!! Thanks! It's such a photogenic display when I'm taking product photos too, showing some more vintage collection goodness in the background. I love your blog. I read it every update that comes to my email. You are so good with design and color. My husband has a huge record collection (mine is tiny in comparison). 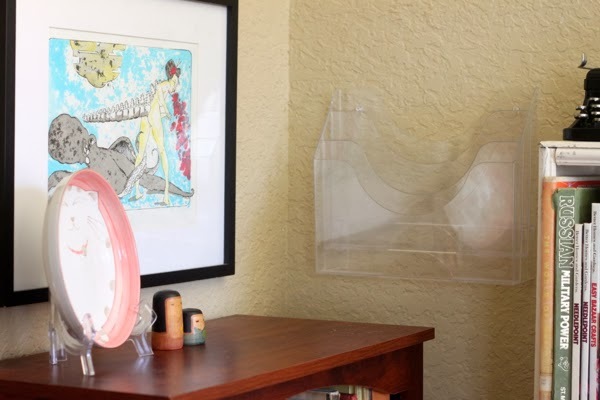 The clear plexi-glass wall mount is such a fantastic idea for display. 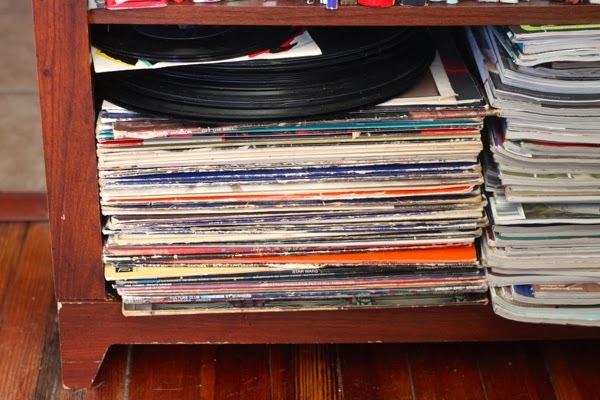 You probably already know this, but you aren't supposed to stack your records on top of each other! I have to say, that is totally a girl thing, and I do appreciate it. Aw, thanks Angela! I'm working hard behind-the-scenes curating this apartment and it's paying off. :D I felt bad stacking my records like that, I was organizing and ran out of steam. I'm horrible about that. I love these ideas! I get weirdly excited over storage ideas. I'm in the midst of some serious cleaning/organizing/purging in my apartment and these ideas are giving me extra energy. 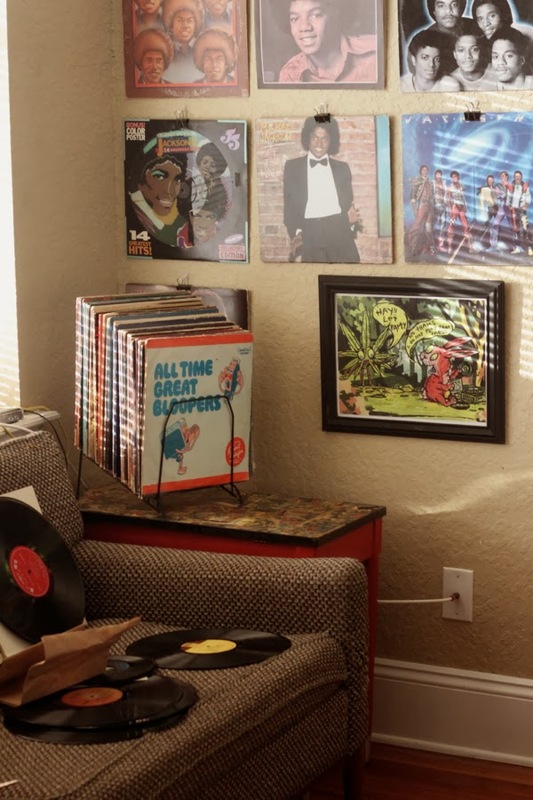 Love how you hung the Michael records with binder clips, too - genius! I forgot about the binder clips. I love them for hanging art, will have to do a follow up on MODified art hangers. I used to buy them for the retro art but they don't sell well! They have to be very special for me to buy now, or in my genre/artists of choice. 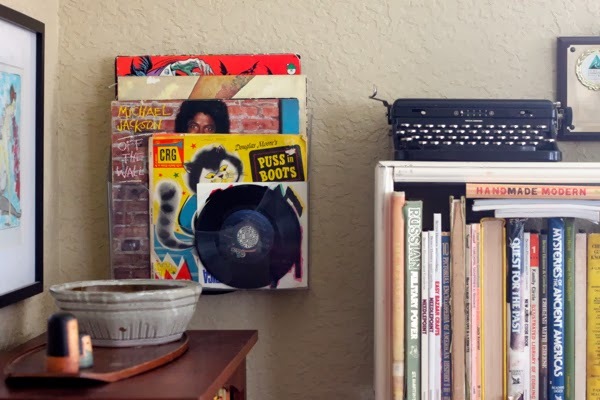 Good record storage solutions! I especially like the clear file hanging on the wall. HOW. CLEVER. IS. THIS. The clear plastic wall organizer...I officially want a wall of those instead of shelving to keep all my little record/small book piles! This could incite a straight up revolution in the way I keep my collectibles. Thanks for the inspiration!!!!!!! Good luck on your record player hunt (I'm rooting for that MJ one you mentioned....omg, perfect?). 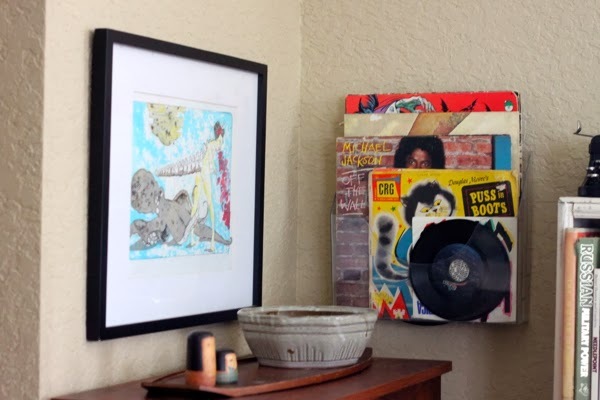 I'm not a record collector, but I do love to use thrifted stuff for decorating and organizing. I've come to realize that I really like hat boxes for that purpose and would really need to find some more. Also, I like sticking stuff in old jars. Fabric scraps, buttons, screws, nails, or whatever little item are contained and good looking. I love the way your tunes corner came out! That would be a fun place to do a photo shoot for a music lover or DJ or something. Nice work! Thanks Melissa. A friend did call me to do a photoshoot for a local rapper in my old apartment and the photos were awesome. I may have to get into more creative portrait photography for artists. Thanks for the organization recommendations. I have a series of these on the way!